It's Not Work, It's Gardening! : Cleaning out "the stream"
The Spring of 2006 was a big one in my garden, as we had the locust trees that were closest to and overhanging the house removed. That opened up our yard in an immediate and drastic way, but left me with pretty much a blank canvas in the area right behind the house, what I referred to as "the bowl" since it was a bowl-shaped depression. My idea was to put a patio here, with a pergola for some shade since all of the trees were now gone. If you've ever had a substantial tree removed, you know how your yard can change from full shade to full, blazing sun in no time. It's a shocking, scary change, but a great opportunity to grow a bunch more sun-loving plants. I won't get into the details of the design right now, other than to say that a key feature was going to be a much-needed staircase with a "stream" running downhill next to it. 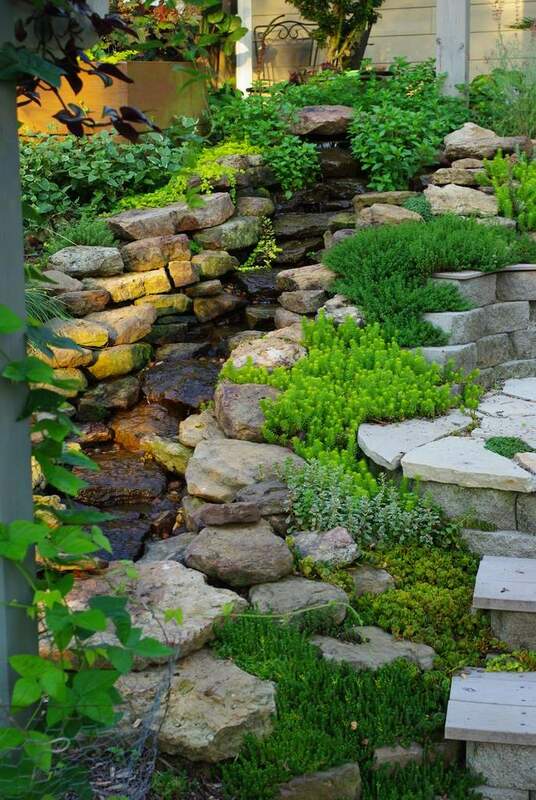 This stream has added so much to the garden by attracting wildlife of all kinds, giving garden visitors something to watch, and more importantly something to hear. 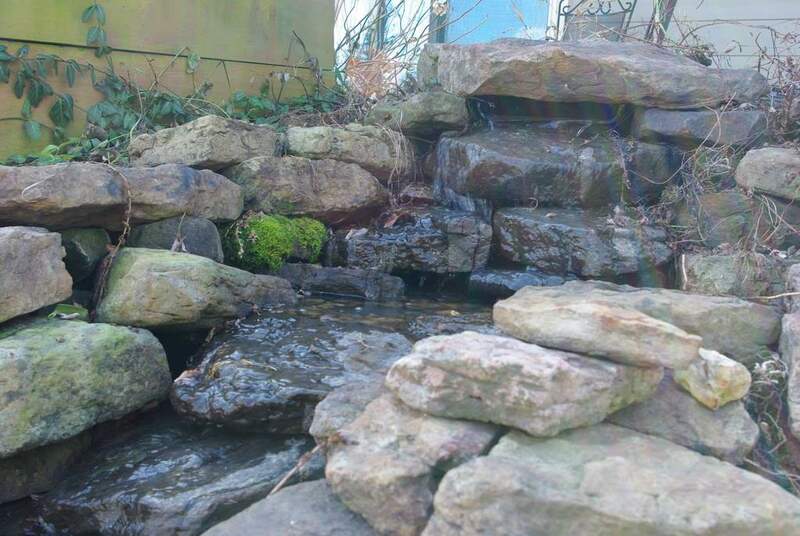 The gentle bubbling brook sound is so calming, the yard seems dead when it's not running. Unfortunately, it's hard to keep running all winter (as I learned last year) so I have to shut it down for a few months each year. Today I got it started back up again for the year. It's not a difficult task, but it's not fun either. 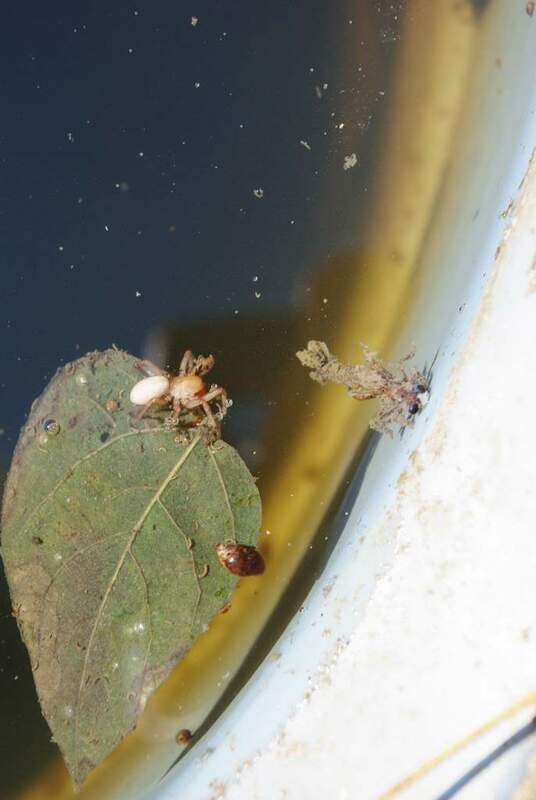 That's a drowned spider and some sort of larvae (maybe just the discarded shell). Two years ago I found a drowned frog in there. Anyway, I tried siphoning the water out, but there's too much debris in there, and it's pretty slow, so the only practical solution is to bail it out. (Actually, I really want to get an adapter for the pump so I can attach a hose to it and pump it out, but I always forget until it's time for the clean-out, and it's just too late then.) Did I mention that the water is still around 40ºF? It's a cold, smelly job. This is about a 3-gallon bucket, so it should take only 6 buckets of vile, stinky water until I'm done, right? Well, not really. Once I get down to the bottom I start running clean water in, and take a few buckets of that out until it's kind of clear. 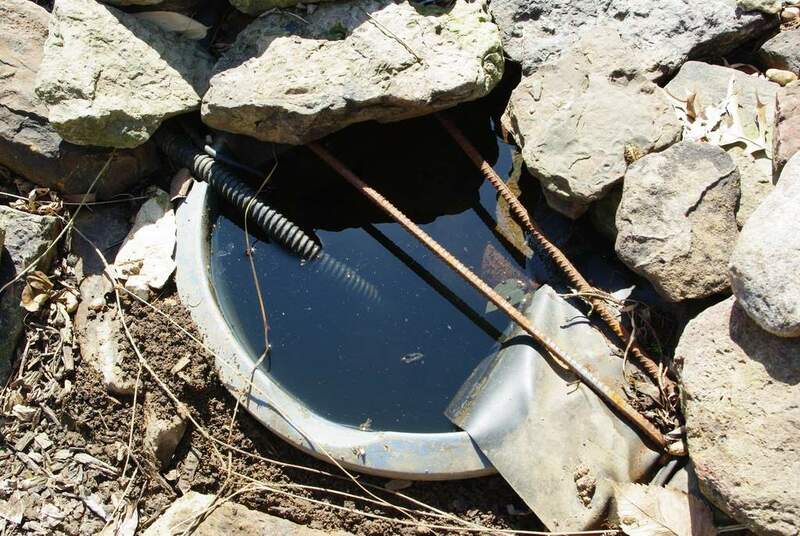 You can leave some of the black gunk in there and it will eventually be broken down by the good bacteria once it warms up, but you don't want to leave too much or the whole stream will smell like a sewer. I learned that the first year. By the way, I'm dumping the old water way in the back of my yard, where it slopes into a strip of common ground. Can't smell it from the rest of the yard, and hopefully it will discourage woodchucks from building a den in that area. 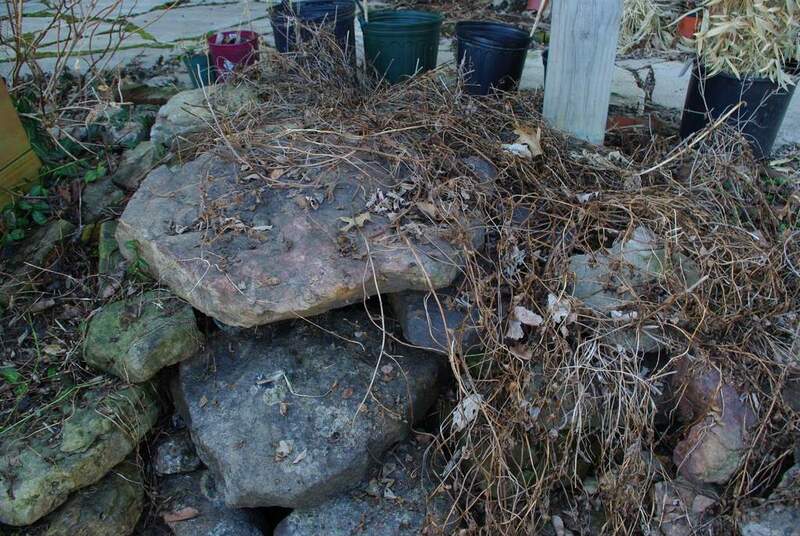 I still need to clear out the debris from the stream, and up at the waterfall box, which is covered in dead peppermint stems and leaves. As bad as the dead peppermint looks, it smells fantastic! Which is a good thing, because the waterfall box (under the large flat rock) has about two inches of black sludge in it. I don't think I cleaned it out last year -- at least I don't remember doing it. 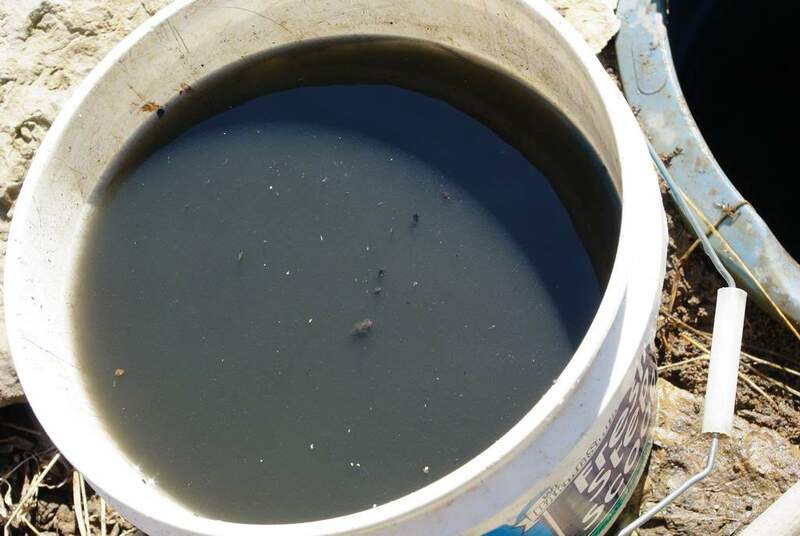 As nasty as the reservoir water was with the sludge in it, the sludge without the water is even worse. By the way, that sludge smell really sticks to your hands, so you might want to wear waterproof gloves, or prepare yourself for a vigorous hand scrubbing. I opted for the scrubbing. So all cleaned out, now refill with water, turn on the pump and hope it still works... and it does! Not exactly beautiful yet (refer to first photo of this post), but it sure sounds nice! 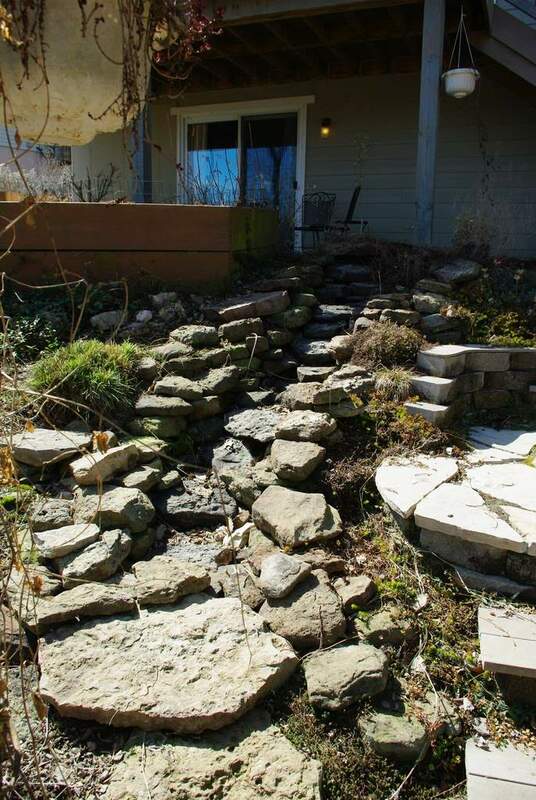 I didn't mention that I may be rebuilding this stream this year, as I've been having problems with it losing water. For now I'll just add a couple gallons a day, but that gets old pretty fast, especially if you have to leave town for a couple of days. How long did it take? About an hour.